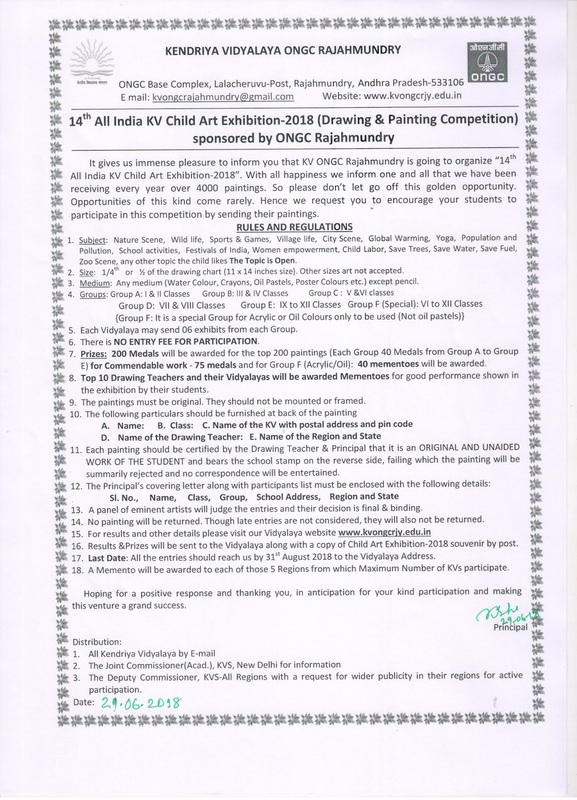 Kendriya Vidyalaya, ONGC Rajahmundry is organizing the 14th All India KV Child Art Exhibition-2018. 02. Size: ¼ or ½ of the chart/drawing sheet (11”x14”or14”x22”inches size) other sizes not accepted. 03. Medium: Any Medium (Water Colours, Crayons, Oil pastels, Poster Colours etc.) except pencil. 06. There is NO ENTRY FEE FOR PARTICIPATION. 08. 25 Special Prizes will be awarded for top paintings from Group F (Acrylic/Oil paintings). 09. 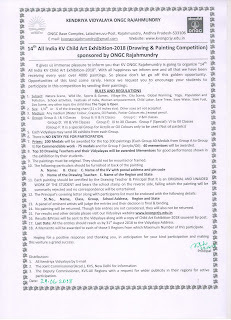 10 Mementoes to the Top Ten Drawing Teachers and their Vidyalayas for good performance show in this exhibition by their students will be awarded. 10. A panel of eminent artists will judge the entries and their decision is final & binding. 11. The Paintings must be original. They should not be mounted or framed. 13. EACH PAINTING SHOULD BE CERTIFIED By the Drawing Teacher & Principal that it is AN ORIGINAL AND UNAIDED WORK OF THE STUDENT done in the KV and bears the school stamp, on the reverse side, failing which the painting will be summarily rejected and n correspondence will be entertained. Sl. No. , Name, class, Group, school Address, Region and state. 15. No painting will be returned. Though late entries are not considered, they will also not be returned. 17. Results and prizes will be sent to the vidyalaya along with a copy of Child Art Exhibition 2017 souvenir by post. 18. All the entries should reach us by 30th August 2018 to the Vidyalaya Address.